Although Huawei still has troubles in the US, the new Huawei P30 and P30 Pro can be pre-ordered stateside thanks to B&H. The models available are the P30 Pro with 256 GB and the 128 GB P30, both unlocked — compatible with T-Mobile's and AT&T's GSM networks, but not with Verizon's CDMA network — and feature dual-SIM capabilities. While Huawei still has to overcome all the legal issues that the company has been facing in the US lately, it is great to know that the P30 and P30 Pro flagships can be acquired locally by those interested. The Huawei P30 and P30 Pro flagships are coming to the US thanks to B&H and the first one should be available before the end of the month. The prices of the aforementioned handsets are US$599.99 and US$899.99. The first price obviously applies to the 128 GB Huawei P30, which can be pre-ordered in Black, Aurora, or Crystal finish. 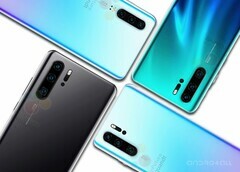 The more expensive — and potent — Huawei P30 Pro comes with 256 GB of internal storage and the same three color choices mentioned above. Unfortunately, there is no launch date for it yet. For those on a less generous budget, B&H is also bringing the Huawei P30 Lite. Listed at US$319.99, this handset comes with 128 GB of internal storage and two color choices, namely Peacock Blue and Pearl White. The only problem is that this handset has no launch date yet, either. The Huawei P30 and P30 Pro will work with all GSM networks stateside, but using them on Verizon's CDMA network is not possible. These being said, remains to see if B&H will be flooded by pre-orders or not. After all, Huawei apparently depleted the initial stock of P30-series flagships in China in a matter of seconds.